All the believers were together and had everything in common. 45 They sold property and possessions to give to anyone who had need. 46 Every day they continued to meet together in the temple courts. They broke bread in their homes and ate together with glad and sincere hearts. In the last few years, there have been many intentional communities springing up all over the United States. 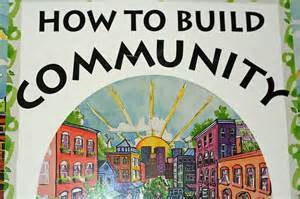 Neighborhoods, where residents form a community to support and encourage the residents in that community. When I first heard of these communities, I thought it was a strange idea. As I researched some of these communities around the U.S. I realized that these Christians are living a modern day version of the Church of Acts. These contemporary communities are simply newer versions of monasticism and religious orders that have been around for many many centuries. I have been blessed to work in the Mother house of the Sisters of Providence and in the 3 1/2 years I have worked there, I have learned much from these women about community. They are united by their charism of love, mercy and justice. They work and live together to better the communities in which they live. Do they always get along? No. Sometimes they disagree, but they accept that they each have their own opinions and personalities and love each other anyway. Jesus and His disciples formed a community. The Israelites formed a community as they wandered the desert. The early Christians formed a community. The early religious formed communities, as they formed monasteries and convents. Saint Francis formed a community and there are still many Franciscan communities alive today in honor of him. Saint Mother Theodore Guerin left her home in France, made a new home in Indiana and started a community of women who live and work to better the communities in which they live. For most of us, building community starts with the church. This can be difficult in some churches, where everyone comes together for a couple of hours of Sunday and forget each other the rest of the week. Many churches are trying to build community by starting small groups of like minded individuals. These groups meet once a week and usually stay connected enough to bond and help support and encourage each other. Catholic churches are known for having daily masses so that Christians can meet together daily in the Temple courts as the early Christians did. Another way to build community is in the neighborhood that you live in. Start a neighborhood Bible study and invite your neighbors. I have written a blog post on community transformation. To read that post, click here. We see community all throughout the Bible. It is so important for us to have those people in our lives that share life with us. We need people that will go through the ups and downs of life with us. God never intended for us to go through life alone. He made us to desire that contact with one another. I know sometimes it is hard to push ourselves out there and let our guard down long enough to build relationships. What if we get hurt? I get that. Believe me, I get that. I’m the one with an avoidant personality. Even I know that God made us to do life together and as hard as it is for me to push myself out there, I have to, because God did not mean for us to do life alone. If He had, He never would have made Eve as a companion for Adam. He wouldn’t have had to. Adam would have been fine on his own. Go out, get involved and build a community. Don’t let fear keep you from connecting with other people. Trust God and start building relationships that may last you the rest of your life. You’ll be glad you did!